Strange Culture: Mai Iskander on "Why Garbage Dreams?" Mai Iskander on "Why Garbage Dreams?" I asked director/producer Mai Iskander after I posted about her film Garbage Dreams why she made this film and what she hoped to accomplish. "I hope Garbage Dreams will encourage people to re-examine the true value of what they throw away each day and the real cost of throwing out the expertise of Zaballeen. The Zaballeen would work long into the night to clean up after us, the modern, industrialized world. Beyond that, by creating the world’s most effective resource recovery system they are actually saving our earth. From out of the trash, they lifted themselves out of poverty and have a solution to the world’s most pressing crisis. "I also hope that everyone who sees Garbage Dreams can see a little bit of themselves in the three teenagers of the film. I hope that everyone who sees the film sees beyond the hardship and poverty of the Zaballeen and discovers the riches they possess - the depth of their love and the strength of their community." 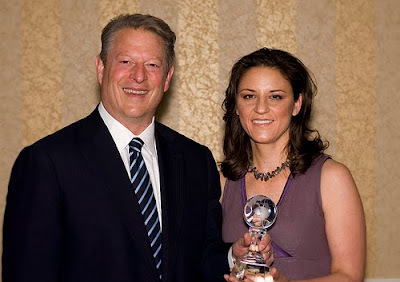 *Pictured above is director/producer, Mai Iskander accepting the One Earth award from Al Gore earlier this year in conjunction with her directing/producing Garbage Dreams. I think those are 2 of the things that I took away from the film. I was greatly impressed with the resoursefulness of the tight-knit Zebellan community, to recycle some 80% of the garbage they collected and used revenues to do more than just survive.